Four generations ago we came to La Bâtie to eat the local produce. Constance Loriol was a farmer whose cooking became renowned thanks to her rabbit stew. Her daughter, Madame Célie Jacquamet, my grandfather’s sister, invented crayfish gratin (fished from the nearby Duzon River). She transformed the family home into a hotel-restaurant. My parents, René and Marie Louise, took over the baton and modernised the business. It was then passed on to me together with a whole host of family recipes. My mother also entrusted to me the precious crayfish tail soufflé recipe that has been so jealously guarded in our family. Today, my wife Sonia and I welcome you to our beautiful home for a moment of pure pleasure and relaxation. In the family tradition, I try to remain faithful to cooking with local products while constantly refreshing and modernising the menu. In this way, the menu combines traditional family cooking with a twist of haute cuisine. But I won’t divulge all the menu – you’ll have to come and see for yourself! Would you like to enjoy our meals in your own home? Thinking of organising a dinner party, or a get-together? Take a look at our catering menu and give us a call with your order. Take a look at l’Ange Gourmand’s catering service menu. 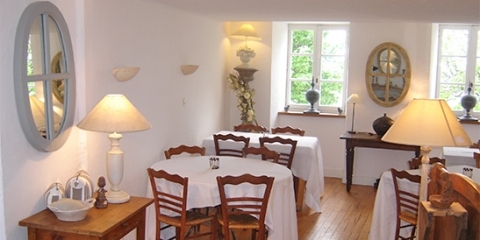 To accompany your meal, l’Ange Gourmand has a wide choice of wine and other drinks.